The term nutrition refers to the sum total of all the processes by which an organism takes in and makes use of the foods it needs to survive, grow, move, and develop. The word nutrition is also used to refer to the study of the substances an organism needs in order to survive. Those substances are known as nutrients. Some organisms, such as plants, require nothing other than a supply of light, water, and simple chemicals in order to thrive. Such organisms are known as autotrophs, or self nourishers. Autotrophs build all the molecules they need and capture energy in the process. A few nonplant autotrophic organisms live in the deep oceans near hydrothermal vents (cracks in the ocean floor caused by volcanic activity). These organisms are able to build their own nutrients without using sunlight from sulfur compounds found around the vents. While green plants get the energy they need directly from sunlight, animals must get the energy they need for life functions from plants. The major classes of nutrients are carbohydrates, proteins, lipids (or fats), vitamins, and minerals. Animals also need other substances, such as water, fiber, and oxygen, in order to survive. But these substances are not usually regarded as nutrients. Proteins. Proteins are large molecules built from different combinations of simpler compounds known as amino acids. Human proteins consist of 20 different amino acids. Of these 20 amino acids, the human body is able to manufacture 12 from the foods we eat. The body is unable, however, to make the remaining 8 amino acids it needs for protein production. These 8 amino acids are said to be essential because it is essential that they be included in the human diet. Proteins that contain all of the essential amino acids are said to be complete proteins. Good sources of complete proteins include fish, meat, poultry, eggs, milk, and cheese. Proteins lacking one or more essential amino acids are incomplete proteins. Peas, beans, lentils, nuts, and cereal grains are sources of incomplete proteins. Anyone whose diet consists primarily of corn and corn products would be at risk for developing health problems because corn lacks two essential amino acids: lysine and tryptophan. The function of proteins is to promote normal growth, repair damaged tissue, make enzymes, and contribute to the body's immune system. Carbohydrates. The carbohydrates include sugar and starchy foods, such as those found in cereal grains, potatoes, rice, and fruits. Their primary function in the body is to supply energy. When a person takes in more carbohydrates than his or her body can use, the excess is converted to a compound known as glycogen. Glycogen is stored in liver and muscle tissue and can be used as a source of energy by the body at future times. Amino acid: A chemical compound used in the construction of proteins. Autotroph: An organism that can build all the food and produce all the energy it needs with its own resources. Carbohydrate: A chemical compound, such as sugar or starch, used by animals as a source of energy. Complete protein: A protein that contains all essential amino acids. Edema: An abnormal collection of fluids in body tissues. Essential amino acids: Amino acids that cannot be produced by an animal, such as a human, and that must, therefore, be obtained from that animal's regular diet. Food pyramid: A diagram developed by the U.S. Department of Agriculture that illustrates the relative amounts of various nutrients needed for normal human growth and development. Glycogen: A chemical compound in which unused carbohydrates are stored in an animal's body. Incomplete protein: A protein that lacks one or more essential amino acids. Indigestible fiber: Fiber that has no nutritional value, but that aids in the normal functioning of the digestive system. Micronutrient: A nutrient needed in only small amounts by an organism. Mineral: An inorganic substance found in nature. Night blindness: Inability to see at night due to a vitamin A deficiency. Nutrient: A substance needed by an organism in order for it to survive, grow, and develop. Nutrient deficiency disease: A disease that develops when an organism receives less of a nutrient than it needs to remain healthy. Vitamin: A complex organic compound found naturally in plants and animals that the body needs in small amounts for normal growth and activity. Lipids. The term lipid refers to both fats and oils. Lipids serve a number of functions in the human body. Like carbohydrates, they are used to supply energy. In fact, a gram of lipid produces about three times as much energy as a gram of carbohydrate when it is metabolized (burned). The release of energy from lipids takes place much more slowly than it does from carbohydrates, however. Lipids also protect the body's organs from shock and damage and provide insulation for the body. Vitamins and minerals. Vitamins and minerals are substances needed by the body in only very small amounts. They are also substances that the body cannot produce itself. Thus, they must be included in a person's diet on a regular basis. Vitamins and minerals are sometimes known as micronutrients because they are needed in such small quantities. An example of a vitamin is the compound known as vitamin A. Vitamin A is required in order for a person to be able to see well at night. An absence of the vitamin can result in a condition known as night-blindness as well as in dryness of the skin. Vitamin A occurs naturally in foods such as green and yellow vegetables, eggs, fruits, and liver. An example of a mineral is calcium, an element needed to build strong bones and teeth. Calcium is also involved in the normal function of nerve and muscle activity. Good sources of calcium include milk and eggs. 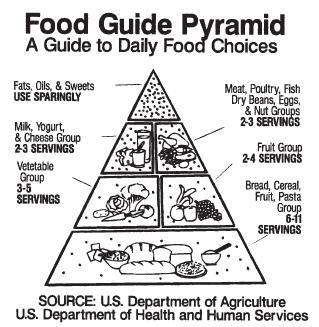 The food pyramid is a diagram developed by the U.S. Department of Agriculture (USDA) to illustrate the components needed in a healthy diet. The bottom level of the pyramid contains the cereal foods, such as breads, pastas, and rice. This group of foods consists primarily of carbohydrates and is, therefore, a major source of energy. The USDA recommends 6 to 11 servings per day from this group. A serving consists of 30 to 60 grams (1 to 2 ounces) of the food. The exact number of servings depends on the age, gender, weight, and degree of activity for any given person. fiber. Indigestible fiber has been shown to improve the functioning and health of the large intestine. Five to nine servings a day are suggested from this group. The third level of the pyramid consists of proteins in the form of meats, eggs, beans, nuts, and milk products. This level is smaller than the first and second levels to emphasize that the percentage of these foods should be smaller in comparison to a person's total food intake. The tip of the pyramid contains the lipids. The small space allotted to the lipids emphasizes that fats and oils should be consumed in small quantities for optimum health. The lack of any nutrient can lead to some kind of disease. For example, people who do not have enough protein in their diets may develop a condition known as kwashiorkor. Kwashiorkor (pronounced kwah-shee-OR-kor) is characterized by apathy (lack of interest), muscular wasting, and edema (collection of water in the body). Both the hair and skin lose their pigmentation, and the skin becomes scaly. Diarrhea and anemia (a blood disorder characterized by tiredness) are common, and permanent blindness may result from the condition. Experts estimate that millions of infants die every year worldwide from kwashiorkor. Rickets is an example of a vitamin deficiency disorder. Rickets develops when a person does not receive enough vitamin D in his or her diet. As a result, the person's bones do not develop properly. His or her legs become bowed by the weight of the body, and wrists and ankles become thickened. Teeth are also badly affected and may take much longer than normal to mature, if they do so at all. Rickets is common among dwellers in slums, where sunlight is not available. (Sunlight causes the natural formation of vitamin D in the skin.) Rickets is no longer a threat in many nations because milk and infant formulas have vitamin D added to them artificially. this is good but it would had been more benificial if the sources of these essential amino acids,carbohydrates, fats , proteins and vitamins would had been mentioned in detail. afterall it is better something than nothing. WONDERFUL!!! I love all this info! thanks for the helpp! Are the single amino acids molecules from lamb the same as those from chicken since both lamb and chicken are "complete proteins" sources according the article? Thanks. what substance provides plants with nutrients?